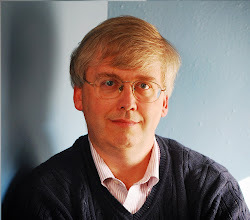 CONVERSABLE ECONOMIST: Too Much Concern about International Reserves? A few weeks back on December 19, I posted on "Can $12.1 Trillion be Boring? Thoughts on International Reserves." In that post, Edwin Truman explained the reasons why the enormous size of international reserves should be a legitimate policy concern. As a contrasting point of view, the Independent Evaluation Office of the International Monetary Fund has published a report on "International Reserves: IMF Concerns and Country Perspectives," which makes the case that the IMF and others have overemphasized the potential problems of large international reserves and understated their benefits. 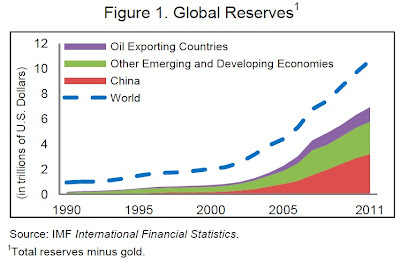 Everyone agrees that international reserves have taken off in recent years, largely driven by changes in China, along with other emerging and developing nations. Worrying about large and growign international reserves may be part of the intellectual DNA of the IMF; after all, the organization was formed in large part to provide a way of dealing with balance of payments problems imbalances across countries. But as the Independent Evaluation Office report points out, countries holding these reserves feel that the IMF should be turning its attention to other targets. Here are some of the arguments (footnotes omitted). International reserves are modest relative to overall global capital markets--and the private-sector portion of those markets in particular should be the real cause of instability and concern. 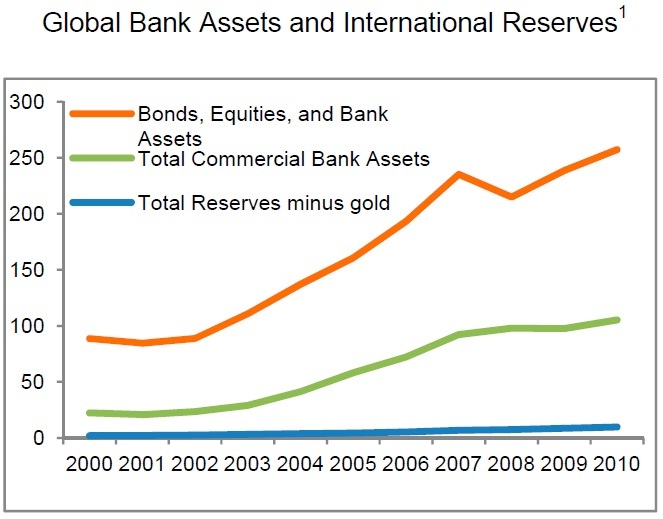 "International reserves remain small relative to the global stock of financial assets under private management ... There is considerable historical precedent and economic analysis to suggest that concerns about global financial stability should focus more closely on trends in private asset accumulation and capital flows. Country officials and private sector representatives also noted that the IMF should be more attentive to the accumulation of the private foreign assets that are the consequence of persistent current account surpluses, and which from a historical perspective have arguably been more destabilizing than official reserve accumulation." 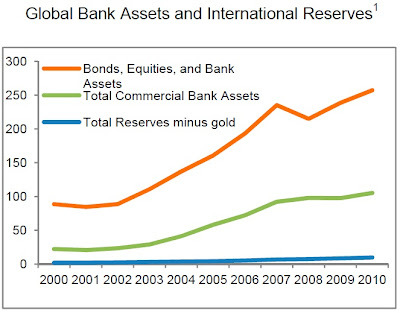 For illustration, here's a figure showing those international reserves in comparison with other global financial assets. Countries that hold large international reserves see them as providing a number of benefits. much alive in a number of countries." Large international reserves are a symptom of the concerns that countries have about instability of capital flows in the global economy, and rather than worrying about this symptom, policy-makers should focus on underlying causes. 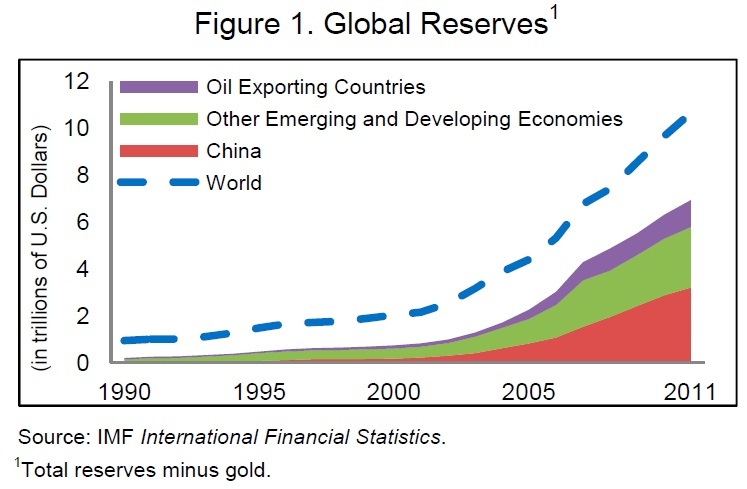 A final point made in the IEO report, which seems to me to have a ring of truth, is that a lot of the concern over outsized international financial reserves is really about the reserves held by China. The enormous reserves held by Japan, for example, don't seem to stimulate the same amount of angst. It's probably not wise to try to set a wide-ranging international reserve policy for countries across the world based heavily on the experience of China, which is an extraordinary case in so many ways.